In landscape photography, it is often recommended to focus at the hyperfocal distance to maximize the scene in focus. But not everyone agrees (and we are not talking about artistic aspects here). 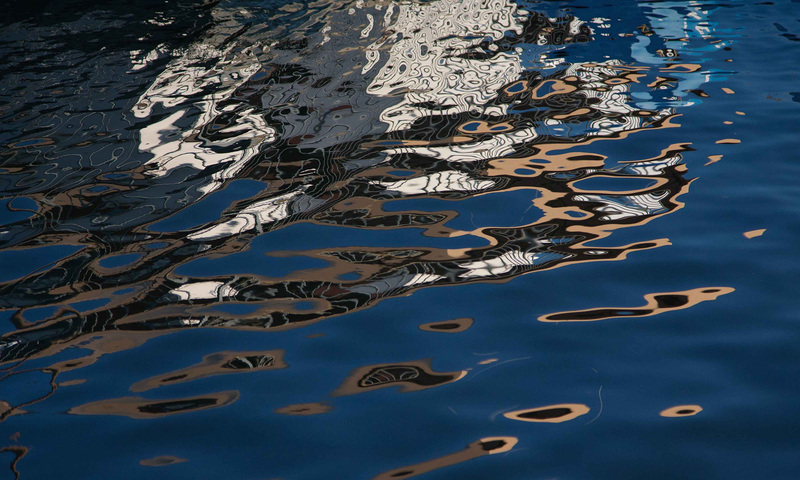 Harold Merklinger, a passionate photographer with a sound background in the sciences, wondered why his images taken with the hyperfocal distance did not really meet his expectations. In particular, he noticed that the more distant objects often appeared substantially fuzzy. The following is based on his studies of the subject [Merklinger 1992, Merklinger 2002]. The basic problem is illustrated in the figure below. Consider a lens with a focal length f focused at a certain distance such that object distance g and image distance h are adjusted according to the lens equation. In this case, the rays emitted from a point in the object plane towards the lens form a cone, as indicated by the purple rays. 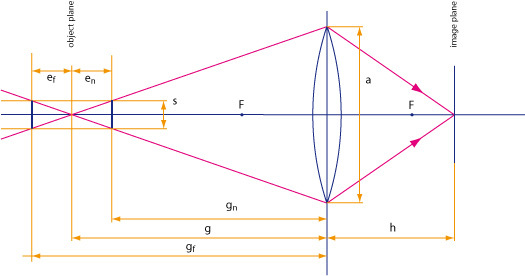 The diameter of the cone is given by the aperture a of the lens. If an object is somewhat nearer or further away, it intersects the cone where it has some finite diameter s. If the object is smaller than s, only a portion of the rays that reach the image plane at the original point will come from the object; the recorded intensity will thus depend on some other contents of the scene as well. In other words, the image of the object gets blurred. The diameter s thus determines the smallest detail the lens can (surely) resolve at that distance. In the following, the diameter s is called the minimum object size. It can be calculated as follows. According to equation (I2), an object located somewhere near the focus distance can be very small and still be resolved. An object somewhere near the camera must be similar in size to the aperture of the lens. According to equation (I4), the minimum object size is thus not limited, but will grow proportional to the distance gf. Objects may thus completely disappear, depending on their size and distance. For a camera focused at infinity, the minimum size of an object to be resolved thus depends on the focal length of the lens and the f-stop used, but not on the object distance. This formula is used for the minimum object size calculator. For example, consider a lens with a focal length of 50 mm and the f-stop set to 8. The circle of confusion is assumed to be 0.033 mm. The hyperfocal distance is thus at about 9.6 m (31 ft). In this case, we get a minimum object size of just 3 mm (0.1 in) at a distance of 5 m, but a whopping 600 mm (2 ft) at 1000 m. Anything smaller than that (including most people) will more or less disappear. On the other hand, for the lens focused at infinity, the minimum object size is about 6 mm (0.2 in), regardless if the object is 5 m or 1000 m away. While the difference at 5 m is rather small, the effect at 1000 m may be quite dramatic. For a 50 mm lens and a targeted minimum object size of 10 mm, set your f-stop to 5. In his publications, Merklinger also investigates other uses of his approach, as in wildlife photography. Note that equation (I6) describes a lower limit for the resolved object size only, as other limitatons such as the finite resolution of the image sensor and diffraction also apply. However, this focusing strategy ensures that we can get as good as lens and camera permit. Also note that neither the circle of confusion nor the size of the image sensor are used, so results are valid for all kinds of cameras alike. Merklinger’s approach leaves us with the somewhat disturbing realization that the hyperfocal distance, even though based on a seemingly solid theory about the depth of field, does not lead to optimal results. So what’s wrong? Simply put, it is optimizing the wrong parameter. The aim of the hyperfocal distance is to ensure that the image of a point is never spread beyond a certain size on the image plane. However, as Merklinger showed, this is not the major problem, as more distant objects will be completely smoothed out. In other words, the image of a point may be limited in size, but this doesn’t really matter if the point is not visible at all. Actually, it makes much more sense to ensure that we can see it. So do I ever use the hyperfocal distance? No, never.